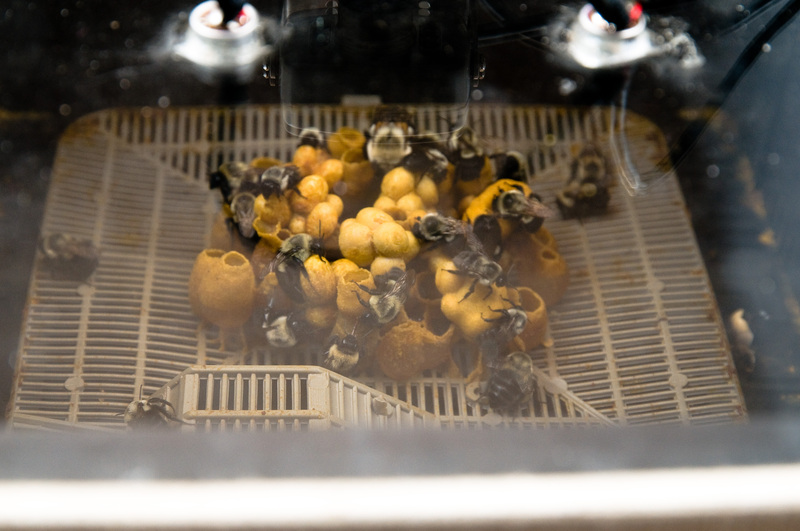 Headphones which “plug” into the bumble bee hive bring together sight and sound of our bees as they go about their hive activities. The forced perspective of the double-lens peep hole of the hive box (as well as the broader view of the hive from above) psychologically corresponds to the narrow stereo placement of two internally-fixed microphones within the hive box. Meanwhile, continuous audio transformations of pre-recorded masses of honeybees and shō (Japanese mouth-organ) fill the gallery. 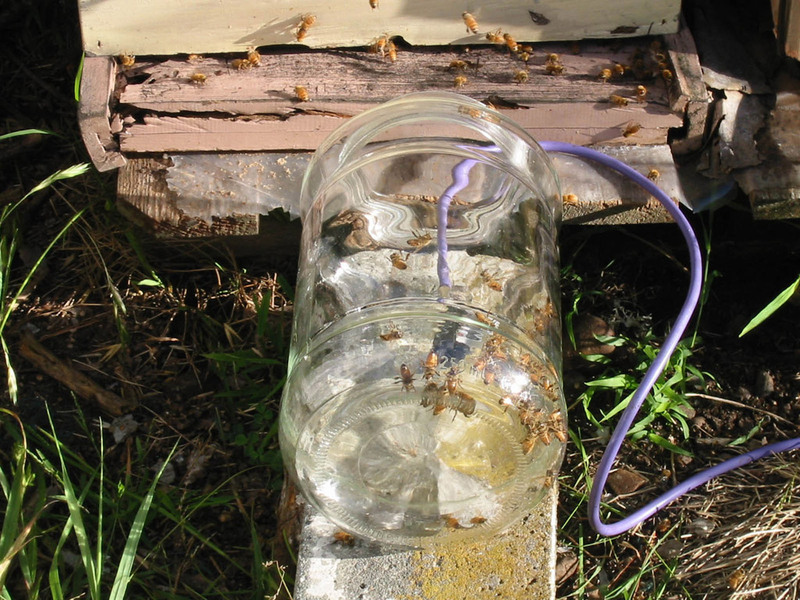 These (pre-recorded) honeybees were gathered inside glass jugs and recorded from inside the vessels, their wings vibrating against the glass and causing the containers to ring at their resonant frequencies. These beautiful, complex sounds smoothly and continuously shift in pitch while overlapping with shō tones, whose upper frequencies subtly shift in timbre. In creating audio for the installation, I wanted to highlight the sounds of the bumble bee hive in the gallery, and, to create a spacious soundscape which would draw the viewer into a contemplative association with the space, tie the various mixed media elements of the work together, and yet not interfere with people’s experiences within the gallery space. Here are some more notes about the sounds, which fall into two categories – live bumble bee colony audio and pre-recorded gallery audio. Live audio of the observation bumble bee hive was amplified in stereo and presented through headphones, which tied in visually with the sound source – the bumble domicile. I chose stereo over mono amplification so that viewer could localize the various sounds of the hive (e.g., pin point sounds in space); furthermore, we set the microphones up in a narrow stereo position on the ceiling of the hive pointing downward, to give a “bee’s-ear “ perspective. In otherwords, the microphones were just a few inches apart, which is where your ears would be if you were small enough to fit inside the box (effectively miniaturizing the viewer, or, psychologically magnifying the sound). This was captivating aurally as well as visually, since one would be viewing the colony’s activities while listening: viewers would first view the colony via the funky looking glass perspective (the lens was actually two different types of lenses combined) and then climb a little higher on the ladder and look into the colony from above, getting an overall view in stereo (with both eyes). You can see more images and video at the Observation Bumble Bee Colony page. Thematically, these sounds reflected the world of “wild”, unmanaged pollinators – in this case (until very recently) unmanaged bees which are indigenous to N. America, Bombus. Pre-recorded audio was projected in the gallery via 4 loudspeakers (2 stereo pairs, one pair in front and 1 in the back) from a mix of CD tracks on random play choosing from tracks containing the sounds of processed honey bees in glass jugs, comb-filtered shoh/mouth organ and silence. These sounds were initially manipulated using patches I created in Max/MSP, which are documented at sarahpeebles.net . Thematically, these sounds reflected what are now cultivated pollinators with whom humans have had a very long cultural and agricultural association – honey bees, which, incidentally were imported to N. America with European settlers from the 1600’s onwards (see notes on bees and co-evolution in N. America under “resources”). The shō was introduced to Japan from mainland Asia between 400-500 A.D. and has changed little since then, though its mainland cousins have transformed considerably. It reflects a remarkable historical relationship between humans, bees, trees and metalsmithing. Its metal reeds, hidden within bamboo reed pipes, are traditionally held into place with a preparation of beeswax and pine resin, and are tuned using a similar substance containing fine lead pellets. The initial placement of reeds within the pipes and their tuning requires a gentle heating of the wax-resin substance and the metal tools used for these tasks. 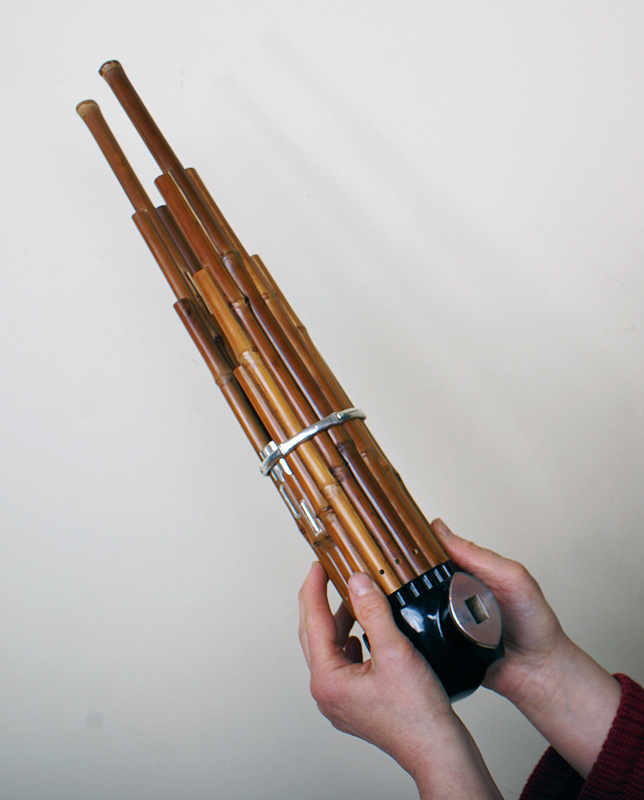 The 17 pipes which make up the entire instrument are held snug by a silver band designed to emulate the shape of bamboo. Sarah Peebles – audio installation, project lead.